Nearly three-quarters of Americans disapprove of Republicans' handling of the budget crisis, according to an ABC/Washington Post poll released Monday. Disapproval of the GOP, which has risen steadily since just before the government shutdown began, is now at 74 percent, up 11 points from late September. A majority of Americans are also discontented with Democrats' role in the budget negotiations. But disapproval ratings for Democrats in Congress and for President Barack Obama, both of which started at a lower level than disapproval of Republicans in Congress, have remained largely unchanged in the past two weeks. Sixty-one percent of Americans now dislike congressional Democrats' handling of the crisis, while 53 percent dislike Obama's. Those are rises of only 5 points and 3 points, respectively, from before the shutdown began. Republicans themselves are increasingly negative about their lawmakers. In the latest survey, Americans who identified as Republican were about evenly split on congressional Republicans' performance, with 47 percent giving them a thumbs-down. Sixty-three percent of "very conservative" Republicans, however approve. Other surveys have found similarly bleak results for the GOP. A Gallup poll last week showed the party's rating at a record low, while an NBC/Wall Street Journal poll, also released last week, found that Americans assigned Republicans far more blame for the shutdown. The latter survey also found evidence of an "ideological boomerang” against the GOP, with support rising for a Democratic-controlled Congress, Obama's health care law and an expanded role for government. The current political atmosphere is reminiscent of that surrounding the government shutdowns in 1995-1996, said pollster Gary Langer, from which he drew a note of caution. "That result might give some pause to prognosticators who suggest that criticism of the GOP today will spell losses for the party in the 2014 midterm elections, just more than a year off," Langer told ABC. "No such impact seems readily apparent in the 1996 election: Ten months after those shutdowns, Clinton won re-election, but the Republicans held the House and Senate alike. Now, as then, what may matter most is not just today’s blame, but the eventual resolution of the crisis, and the extent of damage done en route." 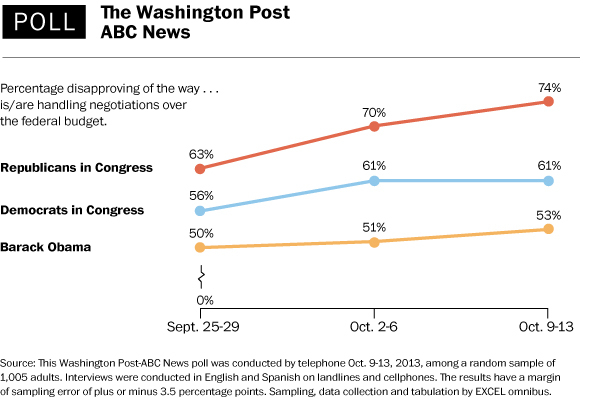 The ABC/Washington Post poll surveyed 1,010 adults between Oct. 9 and Oct. 13, using live telephone interviews.